Graphic Impact printed a series of photographs for the University of Arizona Baseball Facility. The display is for visitors, new recruits, and to show a sense of pride in the accomplishments of the team. Each piece consists of three panels for a total size of eight feet high by twelve feet high. The material is brushed aluminum. Indoor and outdoor durability is always a factor in a design such as this. 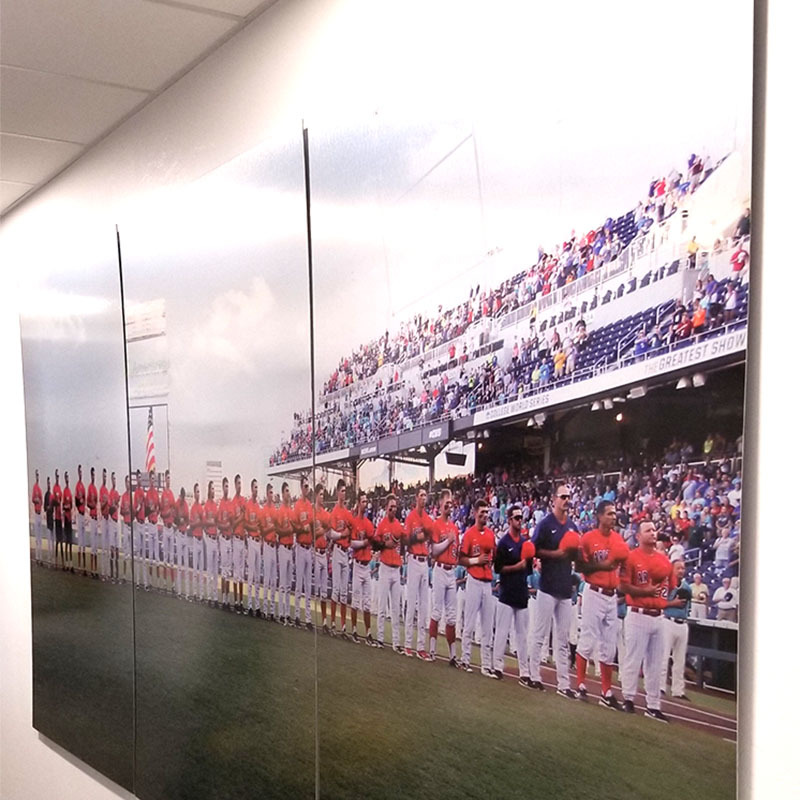 These photographs for the University of Arizona Baseball Facility were printed with eco-friendly ink and then a final finishing touch with Graphic Impact’s clear coater. Fantastic look with rave reviews. Shown here is one of the panels that should send a message for all of us. This material is E Panel (DiBond could also have been selected). Thin pieces of aluminum that are brushed and adhered to a piece of PVC. Aluminum has become a favorite for photographic printing at any size. SPECTACULAR RESULTS! The brushed aluminum signs are not printed white and have the metallic look that one would envision for aluminum signs. But rather than a smooth metallic it is brushed in nature. This process has also become a very popular home accessory. Consider sending your favorite photo to us for reproduction or select great photographs from local Tucson photographers. We have a large variety of landscapes, animals, classic cars, and sunsets.